Subsequent events certainly did not turn out well for the U. S. While inflation remained comparatively mild in 1972 at 3.7% for the year, the rate of price growth jumped to 6% by the end of 1973 and 11% in 1974. The ensuing recession of 1973-1975 was comparable in severity for much of the U. S. to what we have experience so far in the “Great Recession”. Further by building inflationary expectations into the system, the experience of the early 1970s set the stage for even greater inflationary damage later in the decade. On an inflation adjusted basis, stock market prices would continue to decline throughout the decade. Not until the shock treatment of the early 1980s was the Fed able to restore price stability and set the stage for two decades of growth and a twenty year bull market in the 1980s and 1990s. Certainly there are significant differences between 2012 and 1972. By 1972 inflation had been building in the U. S. since the mid-1960s. Wage inflation was strong, running between seven and eight percent for much of 1972. 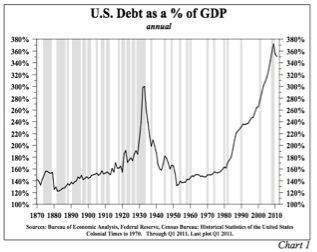 On the other hand, the U. S. and the world at large had much lower levels of debt than we do today. Further, the inflation of the 1970s did not really take off until the oil shock of fall 1973. Without a trigger it’s not all that likely that the U. S. will experience an inflationary shock. In fact the “smart money” continues to bet that we are on the verge of deflation, not inflation. Interest rates are at levels unheard of since the 1950s and the entire U. S. economy is dependent on borrowers continuing to enjoy low rates for “an extended period”. For the rest of this article, however, let’s think the unthinkable. Are you prepared to bet your entire economic future on the assumption that there will be no price shocks in the world over the next few years? We’ve just published a piece suggesting that in 2012 we may witness a much stronger economy than is generally expected. Our thesis here is, should that occur, the U. S. may experience far more inflation than is currently anticipated. (1) The U. S. and the world at large have witnessed an explosion of debt over the past three decades. I’m betting inflation is perceived as the least painful choice. As we wrote last week, it appears to us that the fix is already in. By continuing to fund massive federal deficits, the Fed is building the foundation for significant levels of inflation, absent aggressive action to pull back the liquidity just before things get out of hand. The only real question is when the inflation will start. This is an election year. What are the odds that the Fed would put on the brakes in time, were growth and inflation to explode just before the 2012 election? (3) Price stability in the western world has depended on two significant factors: (A) the depressing impact of globalization on wage inflation in the western economies; and (B) increasing efficiency in the manufacturing, retail and service industries driven by the accelerating robotization of former human activities. While the latter is likely to continue unabated, the downward pressure on prices from globalization may have run its course. You may be surprised to learn as i was that reported U. S. inflation for 2011 was actually in excess of 3%. So long as China remains tethered to the U. S. economy with its dollar peg, it would be misleading to analyze the U. S. market in isolation from China. 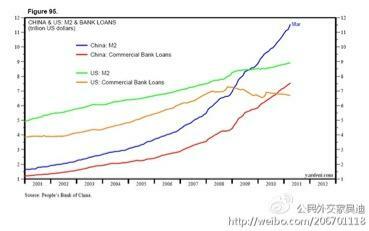 Wages in China have been increasing rapidly. Inflation is increasing as well, averaging 3.6% on an annual basis for the four years ended October 30, 2011 and 5.6% for the latest twelve months, not far from the levels of inflation that sparked the Great Inflation of the 1970s in the U. S. A number of our clients have recently experience significant (20-60%) price increases coming out of China. Pressures to encourage domestic growth, reduce pollution and provide for a rapidly aging work force are growing in China. These will inexorably lead to increasing import costs in the West. (4) We saw some respite in the latter part of 2011 in terms of commodity costs for energy, food and metals. Even so petroleum was at an all time high for the full year and prices do not show any signs of abating in 2012. Economic growth in the non-Western countries so far has come from a relatively low base in terms of per capita resource consumption. The law of compound numbers indicates that continued rapid growth in these economies means that they will take an increasingly larger share of world commodity outputs. That will provide an inflationary bias for the foreseeable future. (5) While the data suggests that there is a good deal of excess capacity in the U. S. economy, past experience has shown that capacity can tighten more quickly that anticipated. We have seen signs with our clients of impending supply shortages in selected industries. Since 2008 a lot of plants have closed. Many employees have been laid off or retired. There are persistent reports of shortages in certain skillsets, particularly those requiring technical training, math, etc. Sure there is a huge overhang of unemployment at the lower end of the spectrum. 80% of the American workforce currently supports the most productive economy the world has ever seen. In that portion of the workforce, we are much closer to full employment than in the economy as a whole. Growth significantly above trend could easily spark significant wage increases in the higher skilled segment, even while the wages of unskilled workers remain stagnant. Remember that the bottom 20% of workers only command about 2-3% of national income. It’s the incomes of the 80% that have a material impact on production costs. The implications of this prognosis, if it were to come about, are significant. The global capital structure is built around an assumption that inflation will remain benign. To the extent that leveraged institutions hold long-term debt instruments, inflation, were it to cause an increase in interest rates, could be as damaging to balance sheets as the mortgage crisis was in the prior decade. For borrowers the affordability of still high levels of personal and governmental debt depends on maintaining the relatively low interest payments dictated by the current low rate environment. That said inflation may feel good for a while if it coincides with a short-term growth spike. Enjoy it while you can. Permalink | Comments Off on Is 2012 More Like 1972 Than 1992?